Over the past few weeks, the feud over hazardous Chinese-made products has played out as a classic clash of nations, as Washington blocked imports of tainted food and recalled unsafe toys while Beijing cracked down at home and fought to salvage the reputation of the "Made in China" label. But last weekend the conflict turned personal when it emerged that the head of a factory responsible for producing the toxic toys had killed himself. Cheung Shu-hung, a Hong Kong resident and co-owner of Lee Der Industrial Co. Ltd., hanged himself in a warehouse in the southern Chinese city of Foshan on Saturday afternoon, China's Southern Metropolis Daily reported. Lee Der, which Hong Kong records say Cheung incorporated with a business partner in 2002, manufactured all of the nearly 1 million toys recalled by Mattel earlier this month. "It brings it home, this whole concern [for product safety] and what does it mean for the China export juggernaut," says David Zweig, director of the Center on China's Transnational Relations at the Hong Kong University of Science and Technology. "We think of it on a massive, macro level. This brings home what it means when this ... happens to an individual businessman." 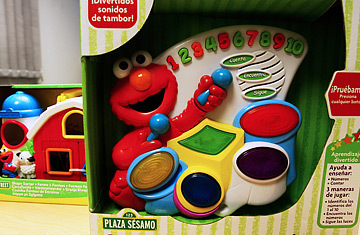 In early August, Mattel's Fisher-Price division and the U.S. Consumer Product Safety Commission announced a recall of 967,000 toys, featuring characters like Big Bird and Elmo from Sesame Street and Dora the Explorer, because of excessive amounts of lead paint. The toys had been manufactured this spring and summer by Lee Der in Foshan. Mattel said that it had worked with Lee Der for many years and that the company had a good track record on production standards. The recall was a particular blow to Mattel, which had enjoyed a reputation for closely monitoring product safety and work conditions at the foreign factories to which it outsourced production, and was seen as a model for U.S. companies who were working with manufacturers in China. Toy manufacturing in Guangdong is a bellwether industry in China. It was among the first to receive outside investment when China's economy began to open up in the early 1980s and Hong Kong businessmen crossed the border in search of cheaper production facilities. Product safety standards have long been an issue, but the unprecedented level of international attention is putting pressure on manufacturers. With its export-driven economic growth on the line, the Chinese government has taken aggressive steps to safeguard the reputation of its goods. It has closed unsafe food factories, issued new regulations for product safety and shuttered the exporters whose tainted chemical products and pet food additives were linked to the death of more than 100 consumers in Panama and thousands of pets in the U.S. The measures are "a combination of window dressing and substance," says Steve Ganster, the managing director of Technomic Asia, a Shanghai-based consultancy. "The window dressing is important politically, but I think there will be true substance that, like anything in China, will trickle down and have an effect in the bigger market." But until that effect takes place, the drumbeat of product recalls looks set to continue: on Tuesday, reports emerged that Mattel would announce another toy recall, over lead-based paint traced to a different Chinese manufacturer.